You have won a year subscription to Badger Sportsman Magazine as well as a set of Motorola Talkabout T605 H20 Walkie Talkies! 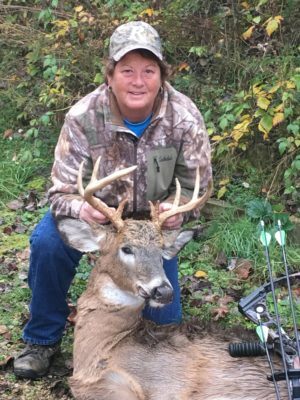 The buck was shot in Grant county with a bow! This was her story! “I heard a branch crack off my left shoulder. I turned to look and I could see his antlers. I slowly turned to my right to retrieve my bow and get into a ready position. I could hear him grunting through the thick brush. So as I turned slowly he was moving parallel to me then…. he started moving away from me on an angle!!!!! After quick thought I took a chance a grunted a bit. Low and behold, he stopped about 80 yards away and then turned and started heading towards my stand. So …”calmly” (lol) I picked out my spot to draw on him then picked out a spot for my shot. As he walked towards me I could still hear him grunting with his head down, I drew, I grunted at him to stop…. and shot him at 17 yards. He was down!!! 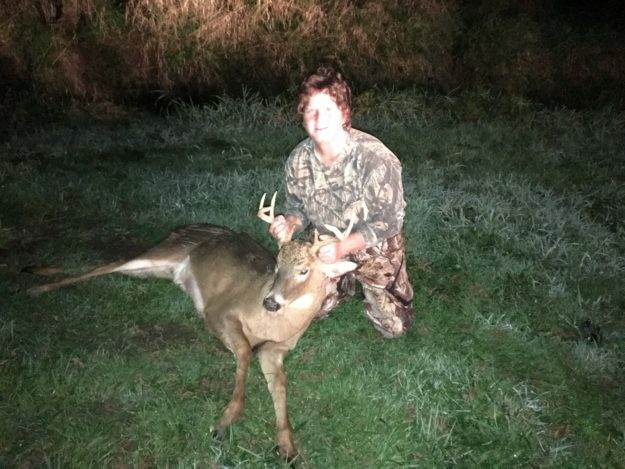 My first buck and a long time coming. I called my brother in law right away!! !